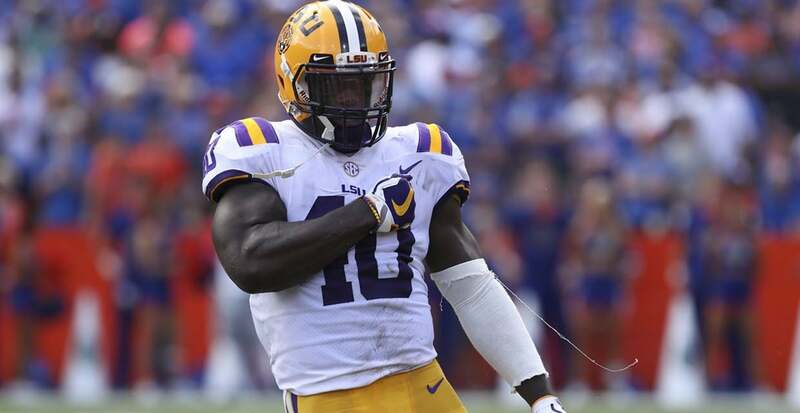 Devin White is, in my opinion, the most dynamic Defensive Player in College Football and is currently a likely first-round pick, if he declares. In his Sophomore Season, White had 133 Tackles, 13.5 Tackles for Loss and 4.5 Sacks in 13 games as an Inside Linebacker. Through 8 games in his Junior Season, he has continued his run game aptitude, having 76 Tackles and 7 Tackles for Loss, while becoming much better when dropping back in pass coverage. White’s Instincts are second to none for a linebacker in the SEC, which is incredibly surprising considering that White is a natural Halfback/Fullback. In College Football, if a player has targeting called against him by a referee in the second half of a game and the call stands, then the player must sit out for the first half of the next game his team is scheduled to play in. Devin White had Targeting called on him for this hit on Mississippi St. Quarterback Nick FitzGerald. Of course, this wouldn’t matter much for LSU if they were scheduled to play against Slippery Rock Tech or something like that. Unfortunately, they’re playing against Alabama. The consensus number 1 team in the country. Yikes. Other than White, LSU’s strength is at its defensive back positions where Greedy Williams, Grant Delpit and Kristian Fulton have helped halt strong passing offenses with ease. Though if any team can solve the puzzle that is the LSU Back 7, its the Alabama Crimson Tide. Alabama currently has the second-best yards-per-game Offense in the FBS and has a potential Heisman winner driving the ship in Tua Tagovailoa. I expect Najee and Damien Harris to have great games against a Whiteout LSU Defense (you like the wordplay), and with Alabama’s stout defense likely keeping Joe Burrow from doing much damage, I’m betting on Alabama -14 and the Under, which is 54. Full Disclaimer: I hate Alabama, I like Money though.